The Munising area offers a variety of attractions for all visitors to the Upper Peninsula. With so much to offer, you may need to book another night at one of our fine lodging establishments! Visit the lodging section to find a great place to sleep! For over 50 years Pictured Rocks Boat Cruises has provided thousands of visitors an unforgettable experience of seeing the Pictured Rocks National Lakeshore formations up close in comfort and safety. Voted #1 Boat Tour in the State of Michigan! 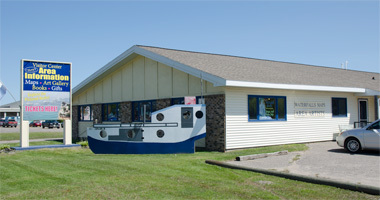 After your boat cruise, make sure to visit our gift shop! Located a half mile offshore of Munising, Grand Island National Recreation Area is a true hidden gem in the Upper Peninsula. The impressive Lake Superior island features a variety of biking, hiking, camping and historical sites for a full day or several days of adventure. The easiest way to get to the island is riding aboard the Grand Island Ferry! The Grand Island Ferry Service makes several trips daily throughout the summer months and is large enough to handle your bikes and/or camping gear. Didn’t bring your bike? No problem! They also offer bike rentals! Take a relaxing boat ride and float above Pictured Rocks. Leaves daily from the city dock. View the Pictured Rocks lakeshore from Miners Castle to Battleship Row. The perfect adventure for your friends and family! Pack your cooler and set out on a trip down the lazy Au Train River! Canoe, kayak, and paddle-board rentals. 1 to 4 hour trips available. Family owned and operated since 1968! See the entire Pictured Rocks shoreline! Enjoy a scenic boat ride, then kayak the most picturesque portion of the trip. Your tour begins on a 56 foot passenger vessel heading out the East Channel of Munising Bay. After viewing several points of interest, paddlers will access kayaks from the boat and continue along the shoreline. The boat will stay on the water within a reasonable distance in case of emergency or to assist paddlers who are ill, cold, tired, or just need of a restroom visit. Paddling will be done with the wind at the paddlers back whenever possible. Once finished with the paddle portion of the trip, board the boat and enjoy a smooth trip back to shore. There’s nothing better than spending a day on beautiful Lake Superior. When you arrive at the dock you will know you are in for a day of fun…Pictured Rocks National Lakeshore in the distance and Grand Island just minutes away. The scenery is spectacular – rock formations, caves and coves, waterfalls, lighthouses. Convenient private dock with parking area. Perfect for spending a day of pleasure boating on the lake. Make sure to bring your fishing poles. Relax…take your time..enjoy all that boating on Lake Superior has to offer. Since 1945, Kimar’s Charters has been taking families and small groups fishing on beautiful Lake Superior. Captain Ric O’Neill offers three destinations for great lake trout, salmon and steehead fishing. These include the Shelter Bay Flats, the Big Reef and the world-famous Stannard Rock. Besides great fishing, Kimar’s also has great accommodations on-site with their five cabin rentals. So make your reservations today for some awesome Lake Superior fishing! Pictured Rocks Golf Club is a beautiful, 18-hole golf course that caters to all levels of play. The course features rolling terrain, natural hardwoods, carefully placed bunkers and a few water hazards. The course is best known for its excellent condition and genuine beauty. Pictured Rocks Golf Club also features a restaurant, driving range, putting green and pro shop. The public is welcome and call for tee times. Come golf 18 holes at Miners Falls Mini Golf which includes 9 water obstacles, a waterfall, and a fountain in the pond. Afterwards, enjoy your choice of 12 different flavors of hand dipped ice cream from Jilbert’s/Country Fresh. Enjoy your ice cream at the new bar counter that overlooks a few holes. Other snack and beverage options are available to you during your play or after. Enjoy a free round of golf on your birthday (I.D. required). Birthday party packages are available as well as group rates for special events. Free Wifi.